A perfectly trimmed landscape will be a focus of your neighbors and guest to your home and landscape. Many time your shrubs, bushes and trees need to be trimmed to maintain its appearance and beauty. Grapevine Lawn Guys are dedicated to maintaining a clean and trimmed landscape for our customers. Many home owners understand that their plants should get trimmed. Yet, they may not understand why it’s very important, making it not completely obvious their yard’s needs. Correct trimming promotes new plant development and growth, both on the branch and generally overall. By reducing excess branches and leaves that are just hurting the plant, it also opens up access for internally growing bushes and shrubs, whatever is left of the hedge to receive more daylight and air. But, if done in a wrong way, trimming can be as bad as striking a supply route. That as well as in the event that you prune in the middle of the wrong season, it can have poor results. Rather, our finishing specialists understand what every one of your hedges and bushes require a special eye for details. Grapevine Lawn Guys won’t trim past the point of no return in the season, we’ll let you know instead of going ahead. Our best need is giving you your best yard. That state of mind stretches out to what is best for your plants and their blossoming season. Bushes and Shrubs are a perfect method to add regular beauty to lawns while giving better protection from sunlight and nosy neighbors. However bushes and shrubs can also turn into a real problem to keep up and maintain their appearance. Shrubs and bushes regularly develop quickly, making it a little difficult to keep trimmed after a short time. Without the correct tools and gear, you’ll likely spend more clipping and cutting rather than trimming them with precision and nice shaping. Tree trimming may require you to climb your tree, thus increasing the danger of falling or trimming power lines. All of your bushes and trees should be coordinated in and around your landscaped area. Modern looks require fresh edges, level tops and perfectly neatly trimmed and formed bodies, while natural located scenes permit “more out of control” developments and shapes. Our expertsat Grapevine Lawn Guys will secure your woody green plants that provides your scene with shade, security, and comfort for deep thinking, or just to impress the neighbors. Maintaining consistence hedges and shrubs does take quite a bit of work. Deciduous or Evergreen – As you may remember from science class, a deciduous plant is one that drops its leaves, and an evergreen stays green year-round. What are you looking for in a hedges and shrubs? Do you want bushes that grow fast, evergreen, and tall? Do you want to block your view of the parking lot lights around the corner? Did you know that in addition to creating an attractive sight line, plants absorb pollutants and noise? Another option is to establish a driveway border of shrubs to invigorate your curb appeal. Another benefit is that guests will be less likely to drive on your lawn? Knowing your landscape features and needs will help you select the right type of shrubs and bushes for your property. Pruning is important to maintain a trees health and control its growth of limbs throughout a landscape. Not only does it help the tree grow, but you can shape the tree by pruning to give a fuller look and contoured shape. Figuring out how to trim trees and bushes my take some trial and error. Who has time to figure out how to really and truly prune trees and bushes. This when you call Grapevine Lawn Guys for help! Pruning trees helps energize and promote new leaf development. Clear away branches from windows, and power lines. Prevents dead limbs from falling and possibly injuring someone or a pet. Sometimes trees need to be prunes to allow more sun onto your garden and lawns. Many plants are not shade tolerant. Although trimming your bushes, hedges and trees is not needed as much lawn mowing, however it should be done at least four to six times a year. Hedges can grow very quickly and soon those well trimmed bushes and shrubs look messy and over grown. So about every other month schedule your trimming and pruning services with your lawn maintenance and save some time and money by combining services. 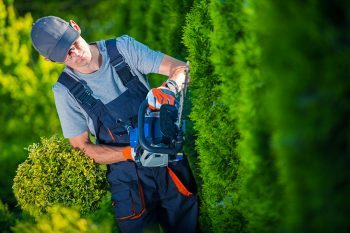 Why not employ the expert services of Grapevine Lawn Guys for the clean and well managed shrubbery trimming and bush trimming needs? Also the piece of mind that trimming trees is not going to be dangerous from damaged or dying limbs. When you require professional help, one name is the best decision for you. Grapevine Lawn Guys.